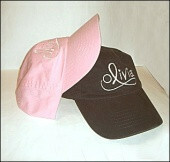 Olivia ballcap...great for both men and women! 100% cotton, low profile, unconstructed ballcap available in pink or navy. Olivia logo embroidered on front in white and tour name Grace and Gratitude on back. Adjustable cloth backstrap. Please select cap color when ordering so your order will not be delayed!